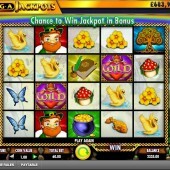 Joining the Megajackpots slots on the IGT network is the Irish-themed Isle O’ Plenty. This, 5 reel, 40 payline video slot which joins Megajackpots Cleopatra and Megajackpots Siberian Storm, making up a trio of progressive jackpot slots available online from IGT. Isle O’ Plenty follows a tried and tested mould, with a 5x5 reel layout and catchy, upbeat music . If you have played Treasures of Troy then you will be familiar with the reel format including the way the bonus symbols appear on the middle reel only. 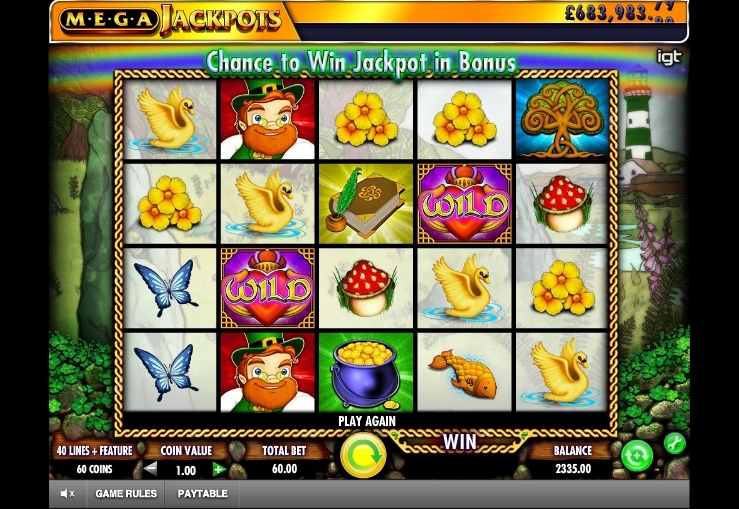 So those that have played lots of Irish-themed slot before will know that there is a pretty standard blueprint for these games, which involves pots of gold, 4 leaf clovers, sweeping rainbows and plucky little leprechaun's popping up to wish you luck every so often. Isle O’ Plenty does have some of these symbols, but has opted for a selection of not so regular symbols including butterflies, golden swans, goldfish, buttercup flowers and a bright red mushroom. Interestingly there is no 10-J-Q-K selection, which is a refreshing change. The bonus symbols only appear on the middle reel and are either a Lighthouse or Castle with the word ‘Bonus’ on the symbol. The Wild symbol is a heart with a sort of crown – it contains the word ‘Wild’ so it can’t be mistaken. Isle O’ Plenty has a special feature called ‘Wild Rush’ which is simple to understand and random in its occurrence. Basically, if a Wild appears on the reels, then there is a good chance that symbols directly below can be turned into a Wild as well. It is essentially an expanding Wild feature, but it is completely random. It seems to benefit you most if you land multiple Wilds, which can increase your chances of 5-of-a-kind wins and other combinations. Land 2-4 matching bonus symbols on the middle reel and you will be rewarded with 6, 12 or 24 free spins. The most frequently occurring of these is of course 2 bonus symbols for 6 free spins, but this feature can retrigger. When you enter the free spins bonus you will get a set of reels with a purple background. The advantage to the free spins bonus is that the Wild Rush feature seems to occur more frequently with greater effect. I have seen anything up to 100x wins in bonus round, I have also seen as low as 2x. A quick mention for the Megajackpots progressive, which is triggered when you land 4 ‘Megajackpots’ symbols in the middle reel. There are smaller rewards for landing 2 or 3 of these symbols, but it is really 4 that you are after. Isle O’ Plenty is a worthy member of the Megajackpots collection. It offers a good balance of wins to playing spend, making it around medium volatility in my opinion. The added bonus of having a progressive jackpot to play for with this slot makes it a good choice for jackpot players. You can keep track of how big the progressive jackpot is in the top right hand corner, but don’t get your hopes up that you might win it as the odds are staggeringly low of you achieving this - I hate to be a buzzkill, but it's true.